This CodeLet let you Programmatically manage members of sub groups. also you can add sub group. you can inviter/remove peoples of sub groups. Invitation will be sent by email. 3-OG Invite People ( og_invite_people ). description = "Customization of OG Feature"
* render invite peopel form. // There is only a single field name, so just pass it as a value. // Add group membership form. // Add group membership form. We still don't have the user or state. // Create a user and return $account object. // Add user to group. 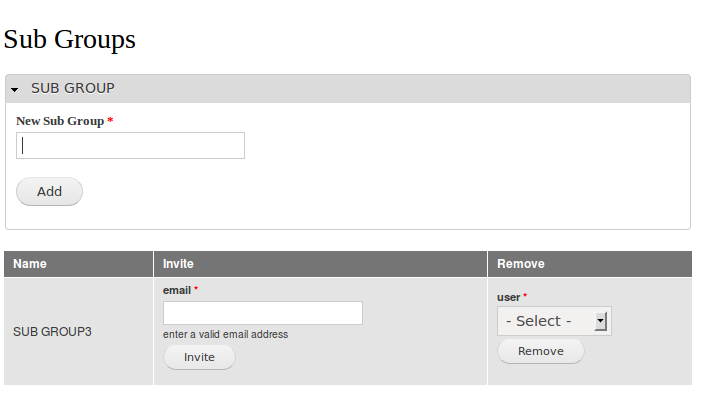 // Offer invitee user account object in form_state. // Invoke hook_og_invite_people_invited() - after a user is created and added to group. // Don't process the group manager, if exists.